Wow, I really liked this novel, my only complaint is that I have been so busy I had to read it in increments and all I wanted to do was dive in and zoom through it, it was so compelling. Imagine a future where you are CURED of love at age eighteen! Lena's mom was not able to be cured of amore deleria nervosa and had to go through the cure 3 times before she killed herself rather than go through it a fourth time. Lena wants the cure, she is looking forward to the cure, all because of her mother, and her society. The cure takes away the disease of love and replaces it with another kind of happiness. She will be paired with a boy evaluators choose for her, they will get married and have children, but there is something missing in the union, the family, the society. Throughout the book Lena calls love "the deadliest of all things: It kills you both when you have it and when you don't." If you are suspected of being a sympathizer you are imprisoned in the Crypts or killed. Lena and her best friend Hana plan to spend their last summer together, running and doing all kinds of things they were afraid to do, before it is too late--you see they won't remember their past memories after the CURE. Hana is beautiful and Lena cherishes their friendship; but when Hana start listening to music that is not approved and going to parties that could be raided by regulators, Lena is torn. Lena wants the cure but she also wants to push the envelope. It is this inner turmoil of Lena's that Oliver is so good at; when Lena unexpectedly begins to falter with her questions at the evaluation; she doesn't understand why she is giving the wrong answers (she is horrified she can't stop herself). When the evaluation is interrupted and she looks up to see a worker observing her; Lena is thunder struck. On a run with Hana, they go beyond a gate and onto a service road; a guard catches them breaking in and he happens to be the worker Lena saw in the observation area. When Lena shakes his hand; an electrical shock passes through her and she pulls away quickly. Lena and Alex begin stealing time together; Hana comes with them many times as they sneak into the places that are off limits. Will Lena be yearning for the cure as she falls more and more for Alex? "This is what I want. This is the only thing I've ever wanted. Everything else---every single second of every single day that has come before this very moment, this kiss--has meant nothing." An intoxicating read, I am looking forward to her next book, Pandemonium. 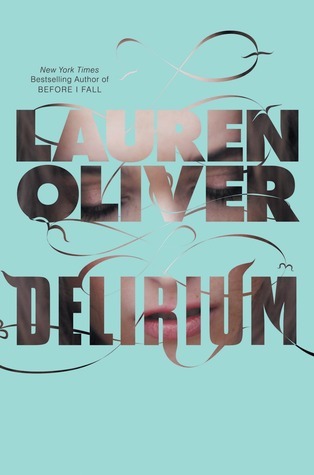 Sign into Goodreads to see if any of your friends have read Delirium. Lori, we have so many of Delirium (order mess up- we got 3 free ones:) ) and we do have Pandemonium so I am excited to get to it. Feeling very overwhelmed with my reading since I have the online Arcadia YA Lit class I teach with 14 students!! !